It's October 1942, in Oslo, Norway. Fifteen-year-old Ilse Stern is waiting to meet boy-next-door Hermann Rod for their first date. She was beginning to think he'd never ask her; she's had a crush on him for as long as she can remember. But Hermann won't be able to make it tonight. What Ilse doesn't know is that Hermann is secretly working in the Resistance, helping Norwegian Jews flee the country to escape the Nazis. The work is exhausting and unpredictable, full of late nights and code words and lies to Hermann's parents, to his boss... to Ilse. And as life under German occupation becomes even more difficult, particularly for Jewish families like the Sterns, the choices made become more important by the hour: To speak up or to look away? To stay or to flee? To act now or wait one more day? 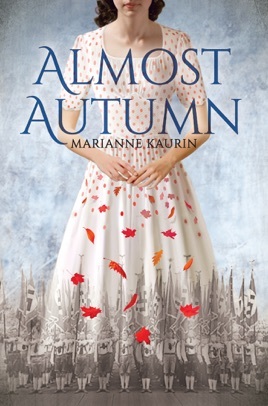 In this internationally acclaimed debut, Marianne Kaurin recreates the atmosphere of secrecy and uncertainty in World War II Norway in a moving story of sorrow, chance, and first love. Kaurin's subtly devastating novel traces the gradual disintegration of Jewish life in Oslo, Norway, during the last months of 1942. While focusing on dreamy-eyed 15-year-old Ilse Stern and her crush on neighbor Hermann Rod, the story unfolds from several points of view, including those of Hermann (whose sudden interest in painting is a cover for his work in the Resistance) and a non-Jewish neighbor who is unwillingly thrust into an important role in the removal of Jews from the city. Even as daily life for Jews in Oslo takes on ominous changes (Ilse's school is taken over by German soldiers, customers dwindle at her father's tailor shop, and Jews' identification papers are stamped with the letter J), Ilse and her older sister, Sonja, are lost in their personal dreams, pushing aside the increasingly threatening situation until the day their father is arrested and their own futures suddenly seem uncertain. In her first novel, Norwegian author Kaurin doesn't flinch from describing the details of the ultimate fate of the Stern family, offering an intimate, chilling look at an individual family's experience of the Holocaust. Ages 12 up.